Since 1500, when the Europeans arrived in South America, an ecological disaster has ensued. The Amazon, the largest tropical forest in the World, a paradise of biodiversity, home of thousands of different people and cultures, which once covered half the country, now represents only 7 per cent of the vegetation from its original state. The Amazon has been systematically destroyed. Brazil’s government is not respecting the ecosystem at all. And we, nature lovers, are always looking for heros who fight against these chain-saw rules. One of them lives in the Colombian part of Amazon, and his work is helping to protect thousands of kilometres and to preserve dozens of ancient cultures. His name is Martin Von Hildebrand, grandfather of Sophia, our Grade 1 student, father of Gregorio, an awesome GS parent. For the last 45 years of his 72 years, Von Hildebrand has dedicated his life and time to protect the world’s largest tropical rainforest battling like a jaguar, walking through the jungle as well as sitting with presidents and politicians in Bogota. 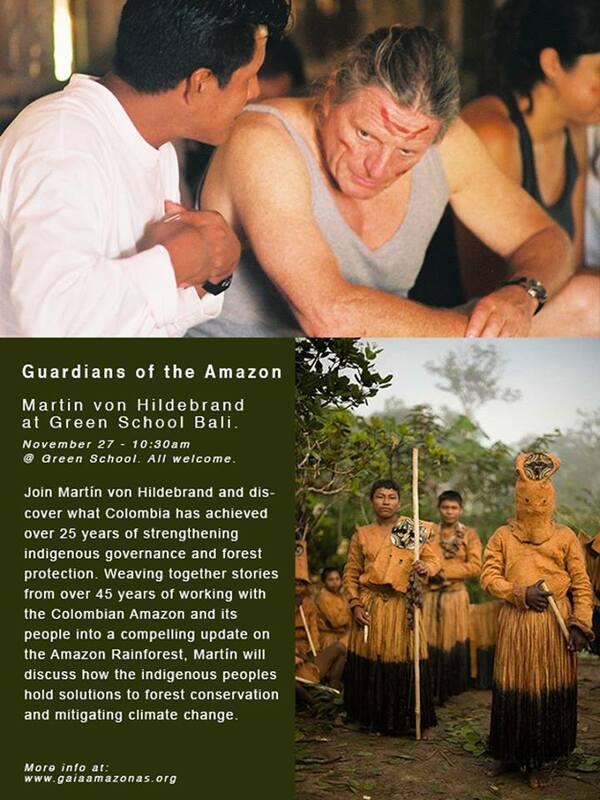 His mission has been to gain freedom, land and respect for the original people of The Amazon and their way of life. Von Hildebrand became interested in The Amazon when he was 15 years old. It became his life’s work at the age of 27. He keeps returning to many tribes where he has made good friends. Today he runs Gaya Amazonas, a powerful NGO that is changing the world’s perception of the Amazonian indigenous people, supporting its culture and biological biodiversity. 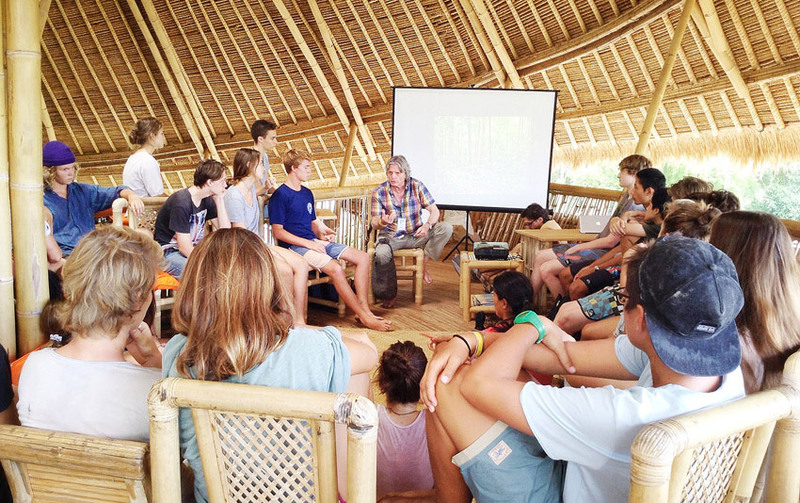 In his talks to the Green School community, Martin showed satellite pictures of how the deforestation has played out. The green has been transformed into red soil. There is dessert, cities and roads everywhere. There is soya, cotton and other monocultures commandeered by companies like Monsanto taking the jungle (and the jungle people). He presented us with words and images of the Universe: magical large and small rivers, giant waterfalls, ancient trees, native people living as simply as any human can. Images from cultures with more then 3000 years of oral history. From his amazing talk, Von Hildebrand shared his most precious times with the indigenous people. Here are some of those moments asked by our little people of Green School. I hope you enjoy them as much as I did.Q:“What did you learn with the indigenous people that we could apply here at Green School?”A: “First of all patience. They, as you here, live in a small community. They have nowhere else to go. So they have to be patient. They need patience to learn how to hunt, to fish, to wait for the crops to grow up, to spend many days just waiting. They need patience with others. So it comes together the respect for the others. They respect different opinions. For them, everyone has their own truth, so they never conflict with someone else’s opinion straight. They just say, ok that is your opinion; I have mine. They are different. So, when someone is talking, they never interrupt the talk, they listen until the end, then they talk. They also have a deep respect for their traditions, for the elders, for the nature. Everything for them is sacred. If they don’t respect it, something bad will happen in their life. When someone do something really bad, they try to give this person an opportunity to think and reflect telling them a myth or a story that suits for that moment. The message goes in there. Other thing kids should learn from them is consistency. You need to keep doing, keep trying to do, what you do. That is the way they learn how to do those intricate baskets, detailed traps, canoes, weapons and tools. Everything needs consistency in life. If you keep doing you will succeed. Kids need to know that.Q:Why do they live in communities?A:They need it. If someone gets sick, the neighbour will get him some food. They need to exchange their kids for marriage. They need to change things. So, for them, everything is about reciprocities. They don’t care about the value of the things, or how much it costs. It is not about buying and selling things, but about reciprocity. I give to you; you give to me. I help you; you help me. Simple like that.Q:How is this division between male and female around them? A:In their vision all living things are complementary. Biodiversity is important, diversity is important. They have learned that with Mother Nature every single animal and plant compliments each other. This same synergy should happen between male and female. They are not the same, but they need each other to keep the energy and the nature flowing. Women are nature; they heal the planet and bring our children. Men need to create and keep the order. They need to balance their energy. But it is important to know that we can’t think about their universe with our western mind. And they don’t want to have our way of thinking inside their universe. They respect us, and want to be respected also. They have their owns systems, calendars, believes. For them, the World is a system with many networks that need to flow around. Q:What can you learn with their Communities? A:There is a lot to learn with their communities. They are still so connected with Nature. They have a huge wisdom that can teach and inspire us about the visible and the invisible. They listen to the spirits, the nature. In the Indigenous Universe there are many worlds, not just one. There is the world of the music, the thoughts, the dreams, enchanted worlds. Everyone needs to follow the calendar, based in the nature that changes during each season. When the rain comes, the water is high on the rivers, the jaguar is inside the forest, and there is a lot of food in the trees. During the dry season it is time for domestic activities, to cultivate the manioc, the water is low at the rivers, there is less food, it is the anaconda time. For them, life revolves around the flow of the river, the animals, the plants, from their activities, like hunt, fish, cropping, and all this connections. It is a system in permanent synergy that can’t be broken. If it happens, the way that they understand the universe will finish.Q:”Who is your best friend in the forest? A:I have some people who always take care of me. It is very important when you are days away from some help. But my best friends are my friends in spirit. Q:Why do you like the forest? A:To get out from our common world and because the forest is so beautiful. Q:Do you miss your family?A: I miss them not because I don’t have their presence, but because I would love to share some moments, experiences and landscapes that I see when I am travelling through the forest. Q:Why do you keep returning to the forest? A: Another day I asked this same question to the Xamãns of my favourite tribe: “Why am I always returning to this sacred place?” The Xamãns smiled and said: “That is because you like our coffee.” I got intrigued. I have never had a coffee there. It took me a while to realize. That is how they teach people. Telling stories. You get the message that you need from them. The jungle feeds my soul.